OK, I hear you asking, “Why talk about profit taking. It’s easy.” Nope! Finish trade and take profit is one of the toughest issues for every trader. And it’s also why a lot of traders fail. It is one of big every day trading mistakes to think that it is quite easy to close the trade and take profit you have in your opened position. Most traders and investors are overwhelmed by greed – very strong emotion and do not close their trade with profit when their can and should. They always think that the trade will go more up (or down for short sell trades) and make more money. Only to see as the trade reverse and their hypothetical trade gains are being erased. So every etf trader, equity trader or self directed investor should protect its mental capital to be able to achieve big profit gains on his/her online brokerage accounts. What to do to protect your mental capital and ensure that your market system will allow you to do trades that generate biggest profit for your financial capital? This is the question every good trader should ask before start of real trading. And the right answer is to create your own well defined business plan that includes detailed basics of trading system that you plan to use for money making. The well defined rules for profit taking in any online trade should be described there. You, as a good trader, must be prepared and know how and when to close your profitable trade and move money to your brokerage account. What it means when I tell that some trade is closed and profit taken “too soon” or “too late”? This picture could explain the idea behind these two important terms. You can define your target by several ways. You can use technical analysis tools to help you with this task. With journal of your trades you can create some statistics. Then, you know the best percentage value of the possible profit you can reach by trade. 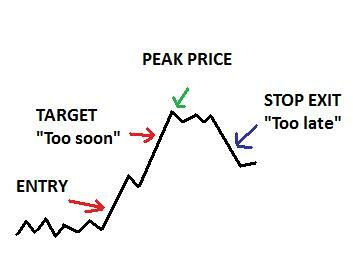 “Too late” means that traders use a trailing stop strategy for closing the trade and profit taking. That means that position is closed during the time when price is already in reversal move from its peak. Good usage of a trailing stop loss method is not an easy job. I recommend you use a small trailing stop for day trades and swing trades and larger trailing stops for position trades. A very good strategy is also to acknowledge the status of whole markets, and based on the current market situation, use closer or wider trailing stops. A final word. Expect that your trade can also finish with less profit than your expected target value. It can also be a break-even trade or loss. Trading is not a perfect game it’s about being profitable! I defined 4 typical outcomes for every single online trade. It is based on history of my trades that I have in my personal trade journal. It is good to know that any online trade could finish this way and set your emotions during market activities accordingly. The best way is to be calm – the worse enemy of every trader or investor is too big greed and too big fear.